A lot is happening in the Dutch digital startup world. Great startups are founded, and great startups are funded for growth as well. The Netherlands proudly created Unicorns as Adyen, and high-growth scale-ups such as Catawiki, Travelbird, TakeAway.com, WeTransfer and Shapeways. More and more Dutch VC’s, either corporate or institutional, are becoming active, as well as successful entrepreneurs re-investing exit proceeds back into startups and many other angel investors. CBInsights has brought us great overviews of tech landscapes in the form of Periodic Tables. They made a start with national landscapes with the UK, but we haven’t seen a Dutch overview yet. So we thought it would be worthwhile to make one ourselves. Also building on the work of Dutch VC Peak Capital aggregating most Dutch VC’s in one chart and StartupJuncture listing most investments in Dutch startups. This periodic table contains the most important software/digital startups with 1 million+ in funding and less than 10 years old; in different categories as Marketplaces & ecommerce, Media & Marketing, Fintech and so on. 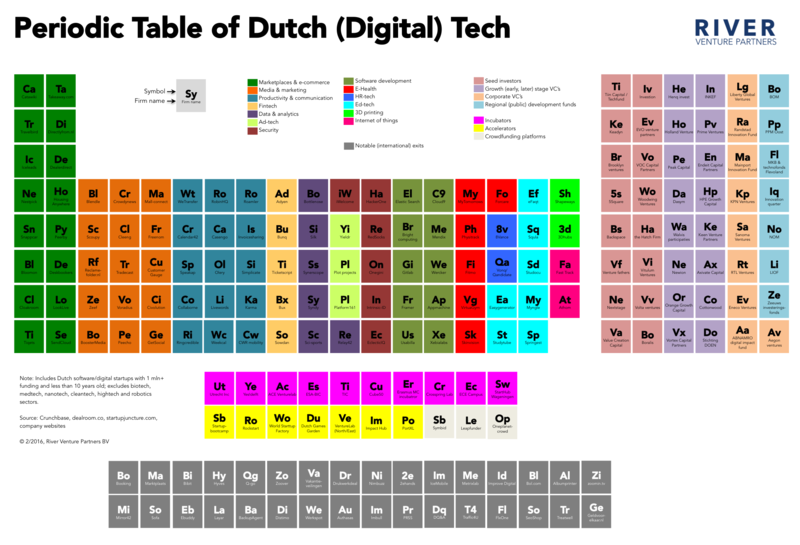 We did not include biotech, medtech, nanotech, clean tech, high tech and robotics industries; these sectors also thrive in The Netherlands with a lot of investment activity as well, and would probably deserve their own Periodic Tables. The overview includes investors, either seed, growth, or later stage. And incubators, accelerators and crowdfunding platforms. We have created a separate list of ‘notable exits’ to provide an overview of Dutch digital start-ups or scale-ups that have been acquired, such as Booking.com, Nimbuzz, Zoomin or Treatwell. We’re sure this chart is not complete, but we hope it provides a useful overview of the current activity in digital tech in The Netherlands. If you have any corrections or additions to make, we would love to hear them. Please add them in the comments. © 2018 - River Venture Partners B.V.